That’s the rep. “How Kyle is” is difficult, like a great painter prone to fits of spleen. Occasionally, he locks himself in the studio for a week and refuses to come out. When he is unhappy to be speaking to you, Lowry will subtly let you know that by staring at you so hard that two burning holes begin to appear in the back of your skull. Other times, he’s great – funny, playful, sharp as a tack. It’s the duality that keeps you interested. In light of the past few days, maybe it’s time to rethink “how Kyle is.” Compared with his most famous peers, how Kyle is is unusually resilient to the pressures of the job. How Kyle is is a very, very good player of remarkable professionalism. 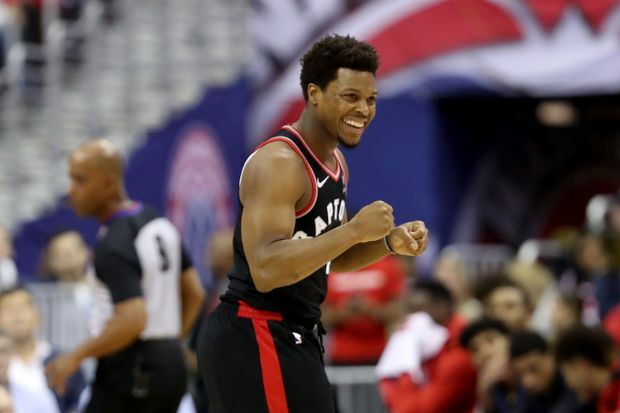 Lowry’s name was once again in heavy rotation on the rumour mill leading into Thursday’s trade deadline. This is an unusual place to find yourself when you are an all-star on a team tipped to make the finals. As per his habit, Lowry was sanguine. “Reassurance would be great, but at the end of the day, they don’t have to call me,” he told ESPN. Then he moved on. Toronto’s gotten used to this sort of thing and so takes it for granted. It doesn’t work like that in other places. In Los Angeles, the Lakers boat is mid-roll after it was made clear that team general manager LeBron James would like to trade everyone for Anthony Davis. Some of LeBron’s junior midshipmen took that amiss. They’re now below decks swinging sledgehammers at the hull. In New York, Kristaps Porzingis had a hissy fit and the Knicks showed him who’s boss by making what will probably turn out to be the worst sports trade since Babe Ruth was run out of Boston. If I had Knicks owner Dolan’s phone number, I would call him to inquire about his interest in certain magic beans that have come into my possession. Some people think Kevin Durant is headed to New York, which is not a ridiculous thing to think. However bad the Knicks are, it is New York. Only one person can know for sure. He decided not to talk about it. When he did start talking again, he used his minutes to berate the media for daring to put the words “Kevin Durant” and “New York” on the same page. Years ago, a great man treated us to the magnificence of “We’re talking about practice? !” Now that is how you scold the media. The current generation gets the equivalent of being moaned at by dad on the drive over to piano recital. It is to weep. It’s not so easy to do this in other leagues, where the rosters are larger and lone malcontents can be isolated and negated. If an NBA team loses the co-operation of a star, it’s over. Lowry could have done that, over and over again. They traded his best friend. He’s already on what will be the only big contract he’s ever going to get. He’s been doubly eclipsed as the team’s golden boy – first by Kawhi Leonard and now by newcomer Marc Gasol. He’s got a bad back. You might be grouchy, too. This is where the “He makes a lot of money. Tell him to shut up and do his job” chorus kicks up. But that is easy to say from our perspective. It’s the perspective of people who, were they to go into work tomorrow and say, “I’ve had enough of this” would do so in the absence of microphones and would find themselves in short order standing in the parking lot holding a cardboard box full of framed photos. Given power, most people will use it. Lowry has chosen to hold his own in check. When they talk about “playing the game the right way,” I can’t think of a better example than biting your tongue when throwing an epic tantrum would be so much fun. Not useful, but fun. Lowry plays the game – and here we are talking about the game of influence – as right as anyone. He’s no Lebron or Durant, and Toronto should thank him for it. By Thursday evening, the Raptors had pulled Lowry back onto the boat. He’s in for the duration. They’d better hope so, though history bears that out. In a league full of loose canons, Lowry has proven himself to be one of the last straight shooters.